Starting this blog has made me realize that I have a thing for cramming food inside of other food. Like, I really do. Really, really do. A lot. So today we continue with tradition (obsession?) 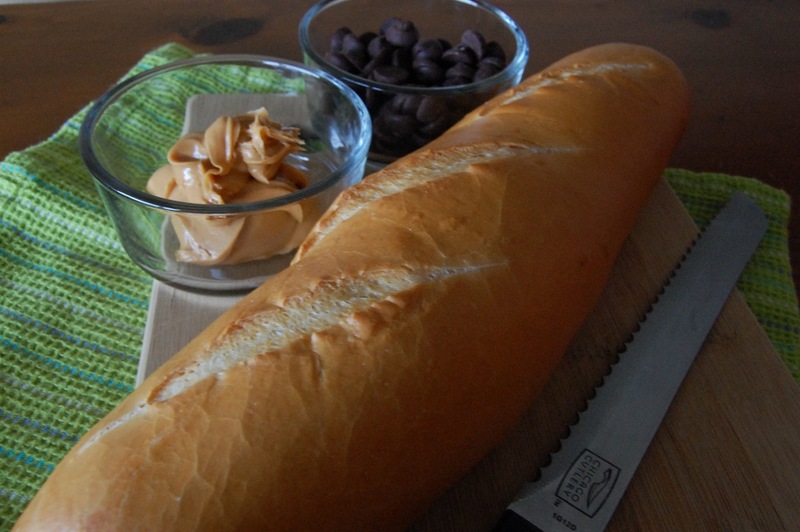 by slipping some chocolate and peanut butter into slices of mini french bread. My grocery store sells mini loaves of french bread, so I started making mini french toast. You can, of course, use a loaf of regular size and up the amounts of peanut butter and chocolate. Doing so will obviously reduce your cuteness factor by 37.8 percent. Your call. Now, the easy “stuffed” french toast involves making a sandwich out of the ingredients and dunking the whole sandwich in an egg wash before frying. Which is fine, if you are okay with a loose definition of “stuffed.” Personally, I like to cut thicker slices of bread and then use a small knife to slice a pocket at the bottom, like this awesome recipe. Keep the opening big enough to fit a spoon in, but no bigger. Slide the knife at an angle to widen the pocket inside the bread without widening the opening. Sure, I could have swept the crumbs out of the shot before taking photos. But I like to live on the edge, you guys. Complete disregard for crumb-related consequences. After a spoonful of peanut butter, add chocolate chips. I used a toothpick to press them down into the deeper parts of the pocket. At this point, be careful not to over-stuff the piece of bread, because you don’t want it to split. All that’s left is to coat them in an egg mixture and throw them in a hot pan. 1. 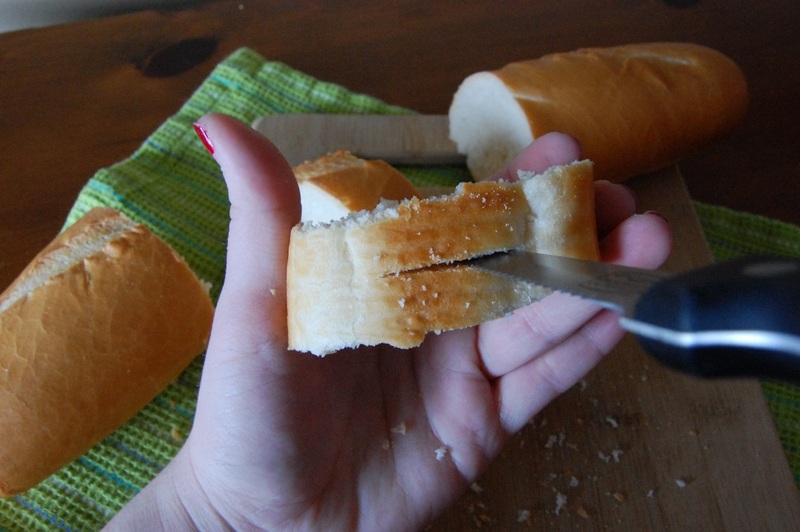 Use small, sharp knife to cut a pocket into each slice of bread. 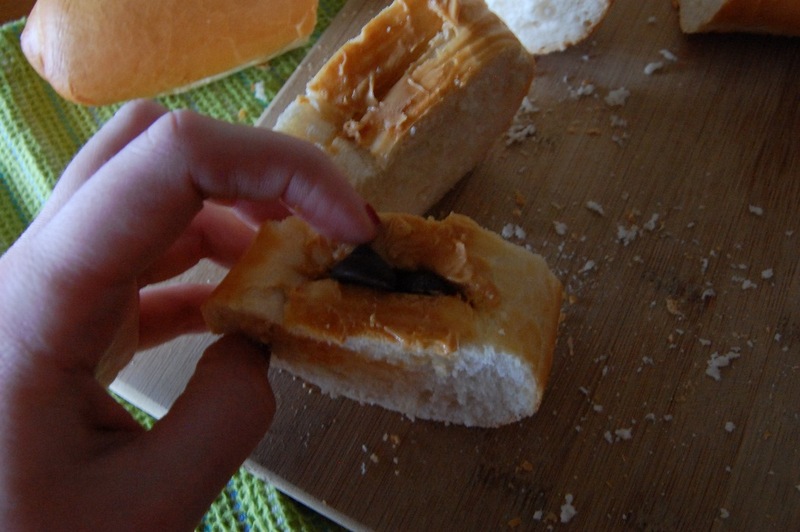 Keep the opening small but slide the knife around inside the bread to widen the pocket itself. 2. Add a spoonful of peanut butter (approximately 1/2 tbsp) to each pocket. 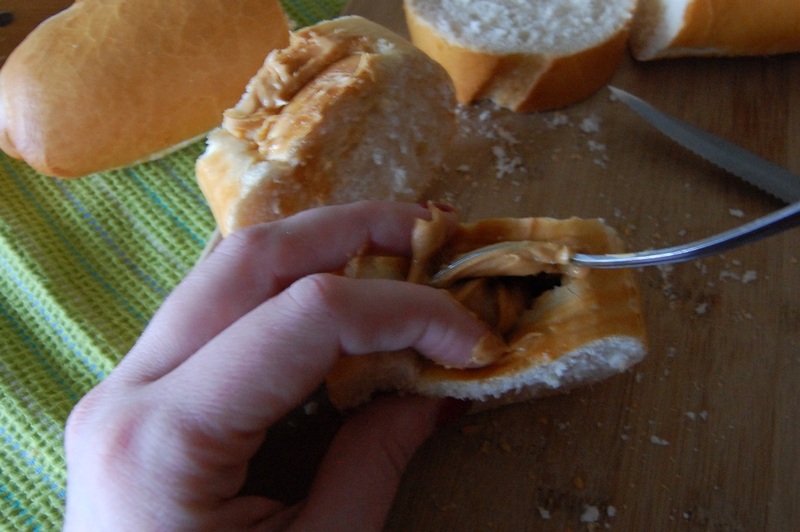 Press the peanut butter as far into the bread as possible without tearing the slice. Add 3 – 5 chocolate chips (or more; whatever will fit without splitting the bread) to the pocket. 3. In a bowl, add 1 large egg, a splash of milk, and approximately 1/2 tsp vanilla. Whisk until well combined. 4. Heat a pan over medium heat. Use a quick hand to coat the slices of bread in the egg mixture. Allow just a light coating of egg (do not let the slices soak up too much of the mixture). Add the butter to the pan – the pan should be hot enough to melt the butter quickly. Add the slices of bread to the hot pan and cook on each side until browned (approximately 3 minutes per side, plus flip each slice onto it’s side for a minute to brown the crust. Do not place the side with the pocket opening directly onto the pan). Serve with powdered sugar, syrup, or your favorite topping. This entry was posted in Breakfast, Desserts, Vegetarian and tagged Breakfast, Chocolate, Cook Time, Cooking, Desserts, Easy, French Toast, Peanut Butter, Prep Time, Quick, Recipes, Simple, Sweets, Yield by Lazy Suzan. Bookmark the permalink. I need to make these!! 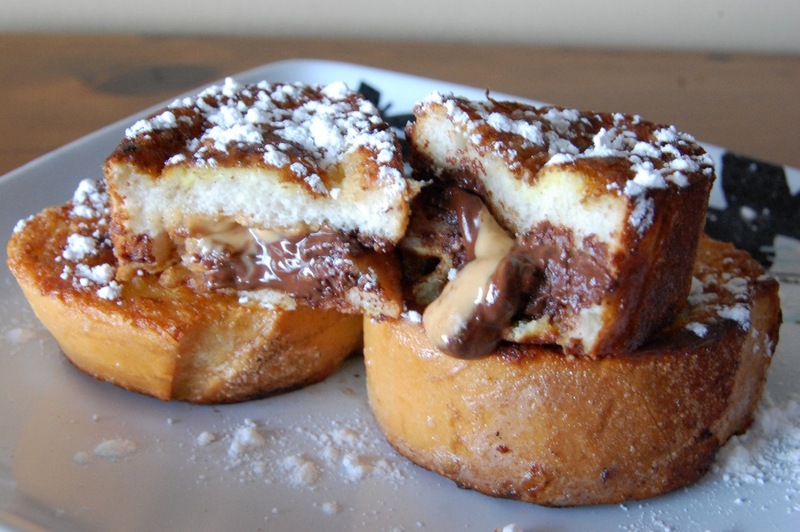 I haven’t tried the peanut butter, but nutella, jelly, and cream cheese make a pretty good combo in french toast. Just sayin! That sounds great! I’ll definitely try it. I’ve nominated you for the Liebster Award! Congratulations 🙂 Now remember, don’t feel obligated… just have fun if you want to and know that I admire you! Here’s the link! ❤ … Nuff said. Makin your Greek chicken tonight, finally!!! This. Is genius. I mean, I thought adding powdered sugar to French Toast was amazing! Never thought of this. I would definitely pair with a ton of sausage and eggs and any other protein I could think of to stave off a diabetic coma! Between this and reading the comment about using Nutella, I may never eat an omelet again. 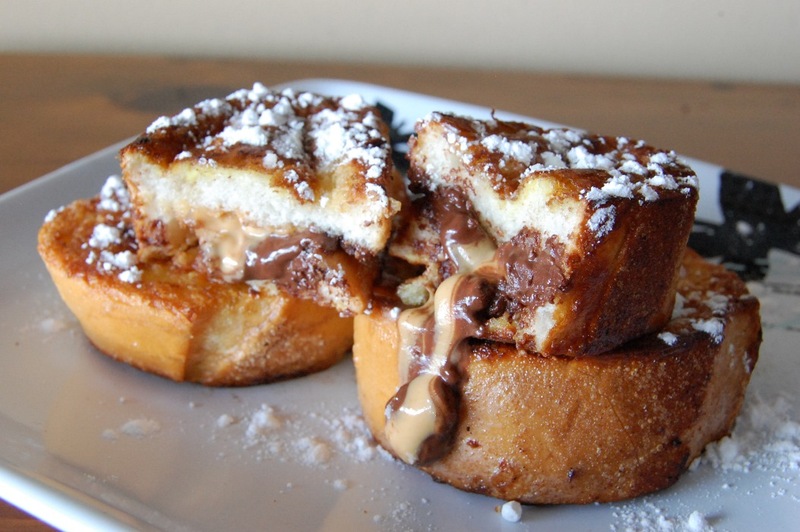 It’s stuffed French toast all the way! I love your detailed photos! I will have to try these…delicious! It will! Hope you try it sometime. Thanks for stopping by. You’re most welcome 😀 And I can’t wait to try this!